The late Sir Edmond Osler, meeting a friend on the street in Toronto a few years ago, asked him to guess what was the most satisfactory investment he had ever made — the most consistent and persistent earner? When I recalled this story during a recent conversation with Mr. Solman, his eyes twinkled in response to the reminiscences of the days when he enjoyed a most intimate friendship with the banker. During the latter part of his life Sir Edmond had a fixed and unshakable conviction that Lawrence Solman would make a success of anything he undertook. This was shown time and time again when Solman’s honesty and sagacity was backed with cold, hard cash. “Were all of your investments as lucrative?” I next queried. Lawrence Solman is an unusual mixture of sentiment and business shrewdness. With his various enterprises basking in the warmth of solvency and pouring profits into his no longer surprised pockets, he continues to live in the same characteristically modest way. When he goes motoring it is in a car that some of his employees might scorn to drive. He was born just back of the present site of the Royal Alexandra Theatre; consequently, this particular neighbourhood has a very strong sentimental attachment for him. Although he has spent the past forty summers at the island, during the winter he lives in an old home on the corner of John and Richmond streets in Toronto. I met him there the other day, and as we walked down John street to King his memory seemed to overflow with the events of the days when that was the aristocratic residential neighbourhood. “It doesn’t look much like it now, but do you know that John street used to be one of the very finest in the town? Why, when I was a young fellow many of the best families lived right along here. “See that house there,” and we had come less than a block, “that is the building where John Ross Robertson was born. Across the street there is the old home of Ed. Hanlan. Down on that next corner was where the old Government House stood. Two of the Heintzman boys were born in those houses there. They look mighty shabby now, but I remember when they were considered fine enough for our most opulent citizens. 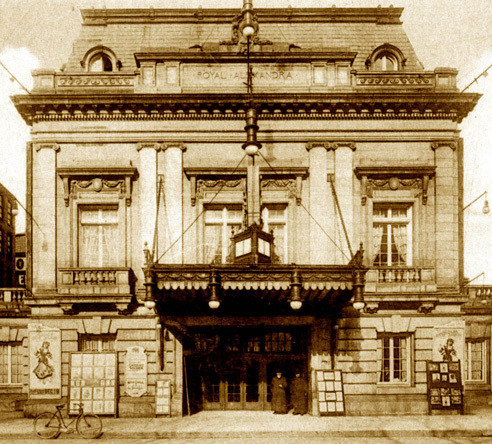 The Royal Alexandra Theatre was built where the entrance to the old Upper Canada College was, and the old buildings and grounds covered the entire block bounded by Adelaide, John, Kind and Simcoe streets. There is a legend that one sometimes hears, and that is that he is penurious. Even to those who have heard no more of Lol Solman than his proverbial cigar, this misrepresentation is so gross as to produce no more serious an emotion than that of amusement. Although I have spent a good deal of time with Mr. Solman I could not draw from him one fact about his benefactions. One has only to spend as much time with his associates to hear of enough incidents of people he has helped in their time of trouble to make a good-sized book. However, I will venture to say that none of these deeds have been mentioned by the man himself but have been related by the unfortunates themselves or by someone that has witnessed his response to some appeal. One of his closest colleagues told a story a few days ago which may be taken as a typical example of his belief that a man should not wait until he is ready to die before using any of his money for helpful purposes. During the early days of the war Mr. Solman had working for him at the Royal Alexandra Theatre a girl whose head had been more than partly turned by the stories constantly coming from trooping actors as to the high wages obtainable in New York City. They finally convinced her that she as imply wasting her talents on the desert air. So one morning she met the boss at the door with a demand for an immediate increase. More in fun than with any intention of refusing her request, the boss asked her what she was going to do to make her services more valuable to the company. This query was all that was required to ignite the fireworks, and on the impulse was interpreted as a refusal. The next morning she was conspicuous by her absence. Past favours were lightly forgotten, and without the mere formality of saying good-by she flew posthaste to the city of opportunity and shattered hopes. On reaching Gotham she experienced little difficulty in securing a position with one of the hotels. Within a few months she was terribly burned in a fire and died. Her people were without the wherewithal to settle her bills and bring her body back for burial in the family plot in eastern Canada. It was to Lol Solman the appeal for help came. Many men might have considered this too much like being asked to turn the other cheek, but not this man. At an outlay running close to the four . . . he brought her body back to its final resting place amongst her own people. Can anyone find a finer case of true charity? It is claimed by those who know him best that he gives over a third of his time to helping others. However, these same persons will not attempt to hazard a guess as to what percentage of his income goes in the same manner. If he does not spend his money on himself, if all of his ventures have long been savoring the warmth of prosperity, is it not reasonable to assume it finds its way to aiding those that are destitute or in trouble? Even though Lol Solman never has refused to assist a truly deserving case he is the kind of a man that never asks or accepts a favour from anyone. One can rake the records of Solman’s youth in vain for evidence that he was afflicted with any pre-conceit as to the place he was destined to fill in the realm of sport and in the world of the theatre. In 1885 he left Toronto to engage in the mail order business in Detroit, and did not return until some ten years later. In 1893 he was married to Emily Hanlan, the daughter of the late John Hanlan. From the time of his return home up till now he has been actively interested in all improvements and developments that have taken place at the island. Some say he wandered into professional baseball, but the truth is he was pushed in. And the late Jim McCaffrey did the pushing. On the death of the latter in 1923 Lol Solman became not only the titular but the active head of the Toronto Baseball Club. This year he built in the city of his birth the finest baseball park in minor league baseball, and there are teams playing in the majors who cannot lay claim to as sumptuous a home. 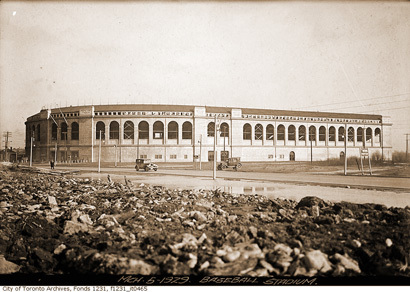 Hanlan’s Stadium, Toronto Island, where Babe Ruth was said to have to hit his first professional home run. Professional ball players, boxers, actors, hockey players and so on, when successful, are paid larger salaries than university president, for the single reason that they bring in the box-office receipts. Consequently, a few generalities on the salaries paid ball players, as told to me by Mr. Solman, are worthy of recording here. “Players are paid so much per month for a season of five and a half month, including all expenses while on the road. “Who is the highest paid man on the Toronto team?” I asked. A few years ago, when Toronto was standing a close second in the league race, Mr. Solman was sitting with a friend at a game on which a great deal depended. The score stood two to one for the visitors and Toronto came to bat in the last half of the ninth — one run down. The first two batters went out: then the next man cracked out a beautiful double. “Well, Lol, I’ll bet that makes you feel good,” the friend remarked. The next batter duplicated the feat, driving in a run to even the count. “Yes, it would if I were a fan, but as the owner of this club it does not. I would rather have seen any other man on the team get that hit. When the time comes to get out the contracts for next season that fellow is going to remember that particular two-bagger, and if it doesn’t cost me five hundred dollars’ — I’ll miss my guess. He hasn’t got one atom of business sense, and I blame him for our team being in second place. All summer he has done nothing but find fault, disturbing other players and generally spoiling the morale of the team through his efforts as an agitator. But you could never make him realize the amount of money he has lost for us, the hundreds of dollars he has driven away from the box-office, though our hot heading the league. Solman was ushered into professional sport by way of lacrosse. The erstwhile mail order man was a staunch supporter of the old Tecumsehs in the days when lacrosse was our great national sport. And when they won the championship in 1911 he sent them to the west in quest of the Minto Cup — the emblem which represented the championship of the world. Anyone who ever attended a lacrosse match in the old days or a baseball game at the island, or one at the new stadium this season, has probably observed the boss of the works wearing a half-anxious, tentative look as though he were wondering what was going to happen to him next; or else you have noticed him the background furtively watching the reaction of the crowd to that particular game, and wondering what could be done to make things more interesting or comfortable for his patrons. When the Royal Alexandra was built some eighteen years ago, there were many who regarded it as a white elephant, but under the management of Lawrence Solman it was made to do its tricks. Lee Shubert was just emerging from the mass of ordinary theatrical producers, and gave promise of becoming one of the powers behind the American midway. With his usual vision, which is one of Solman’s greatest qualities, there was born in his mind a fixed and unshakeable conviction that Shubert was destined to hold the place he does today. The innate modesty of Solman has kept his achievements from being more generally recognized and appreciated. If he had been an equally successful playhouse operator in one of the large cities of our southern neighbor, his name would appear in the big electric sign out in front. And if he had built there as a magnificent a stadium his friends would have insisted on the park being known and advertised by a more appropriate name. However, in future years, when it is more generally realized what this quiet, reticent little man has done towards furnishing us with cheap wholesome amusements, there is little doubt but that the new “Maple Leaf Stadium” will be known by its proper name, and that will not be the only tribute his fellow-citizens will pay him when his absence has made known the value of his presence. As one is thrown in contact with his employees, he discovers man after man who have been on his payroll most of their lives — one of these assured me it was thirty-three years. He enjoys to a remarkable degree the affection and loyalty of these men. The men that are or have been associated with him in any of his undertakings have implicit confidence in his ability and integrity. It is claimed that Lee Shubert’s most powerful rival today is Marcus Loew; but it is Solman who is given the credit for having so firmly entrenched Loew’s in the hearts and mind of his fellow Canadians. In any case, whether these two great American rivals are foes or secret allies, the fact remains Mr. Solman enjoys their mutual confidence. Recently someone started trouble in connection with the sale of the ferries to the city, resulting in an investigation that completely exonerated Lol Solman, and cleared his name of all inferred or intended stigma. . . . “I am not as young a man as I used to be and the injustice of those charges was a mighty severe blow,” he said. . . .